A few weeks after their departure from Jakarta Carlijn, Monique, Lidewij and Sophie arrived in Singapore. 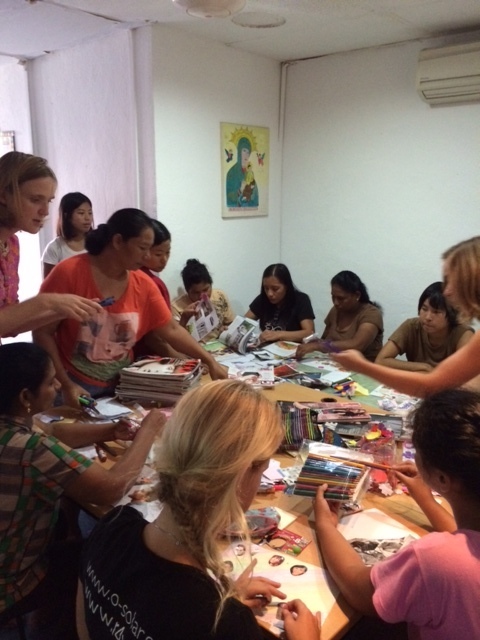 The Dutch girls were invited to join our Dreams Class, where we dreamed about our prospective future’s together with domestic workers staying at the HOME shelter. We found that, although the contestants came from very different countries (the Netherlands, Myanmar, Indonesia, the Philippines, India and Greece) their dreams were not that different. 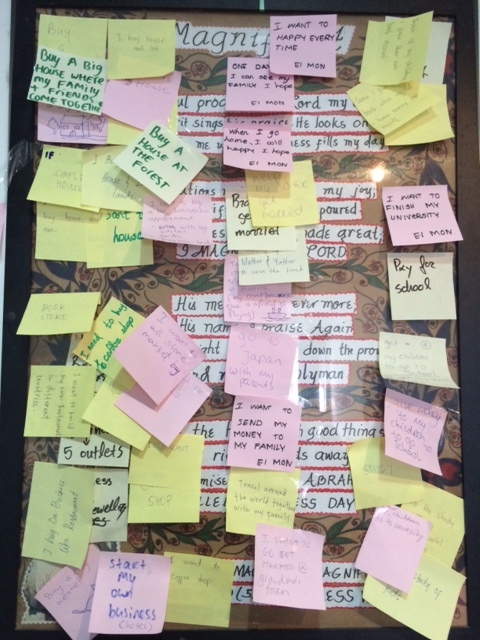 We all wanted to start our own companies, build our dream house and be able to take care of our loved ones. Also, visualising their own dreams helped the girls as a reminder and motivation of their road to realisation of that special dream, their ride for women’s rights. How does the public respond to four cycling Dutch girls? ‘When in the busy Indonesian traffic two red tandems appear, men, women as well as children laugh their heads off. There is astonishment, but we also get positive reactions, when we tell that we will cycle 14000 kilometres from Jakarta to Amsterdam to raise awareness on women’s rights. Four girls cycling? Really…from Jakarta to Rembang? O no, all the way up to Amsterdam?’ They had not expected all these positive reactions, and the sign, conversations and meetings that came forth made a lasting impression on the four. 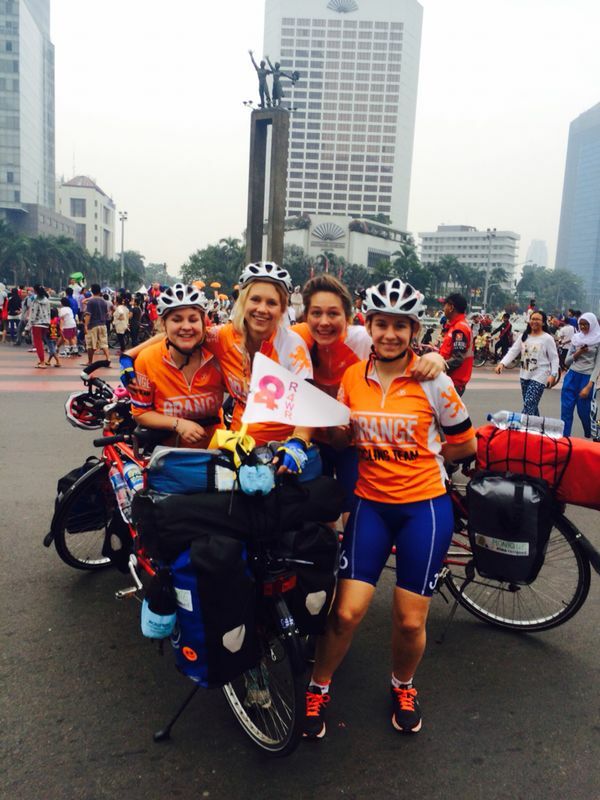 After Singapore, Sophie, Carlijn, Monique and Lidewij will cycle through Malaysia, then Thailand, Cambodia, Vietnam and Myanmar before entering the Middle East. If you want to follow their adventures, do check their website at www.r4wr.or or find them on facebook as R4WR. Rohini*, a domestic worker from Sri Lanka, met Sandeep, a Singaporean of Tamil descent, on the Internet. They chatted frequently, and Sandeep courted Rohini, wowing her with promises of love and marriage, and a good life in Singapore. When they finally met in real life, Rohini fell in love. One day, Sandeep told Rohini he would like her to meet his parents. Happy to meet her prospective in-laws, Rohini followed Sandeep to his family home, only to find the parents absent. There, Sandeep argued forcefully that since they were getting married soon, they should consummate the relationship. Rohini preferred to wait, but eventually gave in. A few weeks later Rohini found out she was pregnant. Sandeep was happy when he heard the news, renewed his promises of marriage, and took her to see a doctor. As Rohini was struggling with her tasks as a domestic worker, he suggested she go back to her parents in Sri Lanka to rest, for the benefit of the child. Sandeep sent her some money, but not nearly enough to support an expecting mother. She had to borrow money to pay her medical bills. Last November, Rohini gave birth to a little girl, Marika. Soon after Marika was born, Rohini never heard from Sandeep again. His number had been disconnected. Being a single mother is not easy in a conservative society like Sri Lanka, especially as Rohini’s family is poor. With a young baby to take care of, Rohini could not find a new job to pay off her loans. She decided to return to Singapore to find the child’s father and force him to take responsibility for her. Rohini filed a case with the Singapore Family Court for maintenance for his daughter. Rohini still had hopes to marry Sandeep. But when the Court tracked him down, it turned out Sandeep had a wife already. HOME arranged for Rohini to be assisted by a pro bono lawyer, and eventually a financial settlement was agreed on. Rohini did not realise that under Singapore law, domestic workers are not allowed to marry Singaporean men without authorisation from the government. Pregnancy results in immediate deportation, and domestic workers often feel pressured to undergo abortion just to keep their jobs. Rather than repatriate foreign domestic workers when they become pregnant, Hong Kong grants ten weeks of maternity leave to those that choose to return to work after they give birth. In this way the mothers can provide for their young children, which is especially important if they are a single parent. Even if their partners are willing to ‘do the right thing’ and take responsibility for their actions, Singapore law does not encourage them to do so. Authorisation to get married is difficult to obtain, and living together unmarried is not socially accepted in many communities. The result is that these children are likely to grow up in poverty, with a mother that is ostracised by society, and sometimes even rejected by her own family. It is in the best interest of the child that fathers are held accountable for their children’s upkeep. During her stay in Singapore Rohini stayed at the HOME shelter, and was assisted with legal advice, a pro bono lawyer and supplies for her baby. Help HOME help others like her by donating at http://www.home.org.sg/give/donate.html. HOME could not do the work it does without a large number of volunteers, many of whom are migrant workers in Singapore themselves. 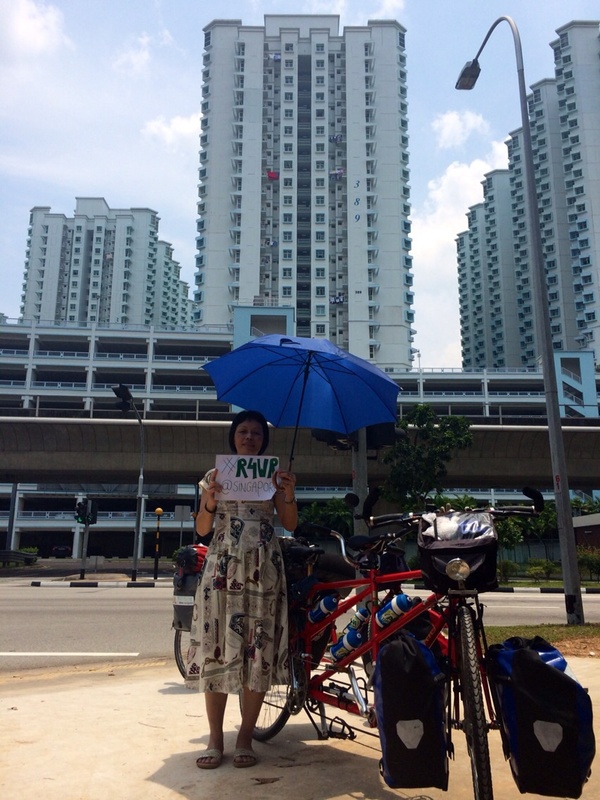 Volunteer Cute, who was a teacher in the Philippines before starting work as a domestic worker in Singapore, spends much of her Sunday off helping and training migrant workers less fortunate than herself. We asked Cute to share her inspiring story. Migration is not as easy as some people think. Being away from your home and your loved ones is hard, and not even money can cure the loneliness many migrants endure. Every migrant worker has a special story. This is mine. In the Philippines my teacher salary was not enough for my family of eight siblings to survive, and life got even worse after my father got sick. Most of my siblings were still studying, so I decided to find work in Singapore. Being a domestic worker is a really tough job, and during my first few years I had no day off. I had to pay eight months of salary to my recruitment agency, work 18 to 20 hours a day, and did not have adequate food. My faith in God as well as my determination to let my siblings finish their degrees made me strong, sacrificing even my own love life. My father always told us that the only wealth that he could give us was our education, and that no one could ever take that away from us. I took that lesson to heart. It’s been 21 years since I left my beloved country, the Philippines, and the house I call home, where my siblings live and my father passed away. I miss him dearly. I did not get to see his face one final time, because my employer told me it would not give him his life back if I went home. Having a day off is important for migrant workers. We can rest, unwind with friends, or learn new skills that help us prepare for our reintegration in our home countries. I believe my own involvement in HOME was the will of God. My feet brought me to the 6th floor of Lucky Plaza, where I met Sister Bridget, the founder of HOME. She welcomed me heartily, and told me about the mission of HOME. HOME gave me the opportunity to attend trainings, and teach seminars myself where I can share what I have learned. I had some great experiences though HOME. I even escorted Sister Bridget to Geneva, Switzerland, to witness the adoption of the International Labor Organisation’s Convention concerning decent work for domestic workers, an achievement that I’m very proud of. My contribution to HOME has the full support of my American employers. I have led the HOME ROSES group for 6 years. The HOME ROSES team is a group of domestic workers that assists HOME with migrant health issues, and gives training and workshops on HIV/ AIDS. I have also contributed to HOME’s newsletter ‘My voice’. When Sister Bridget opened the HOME Academy, a Sunday school for migrant workers, I was keen to get involved. This year, I attended a special training given by the Philippine organization ATIKA, where I was trained to teach other migrants about financial planning. Attending this class will prepare them for a successful reintegration in their home country, so that they will live happily ever after. HOME gives a shelter, a hope and a home to unfortunate migrants, whether it is a woman or a man, regardless of their job, religion and nationality. I pray that HOME will exist forever, and can continue to help us. GOD BLESS HOME and all the volunteers who devote their precious time, their talents & kindness.